This week, neighbor/graphic designer/radio personality/media guru Mick Jeffries shot video for a project he intends to submit to Lexington Film League's Do-Ers Video Contest. 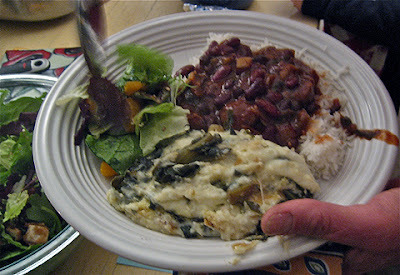 And people brought wonderful food, kids played, adults talked, and a good time ensued all around, camera or no camera. Pepper Cornbread, vegetarian, med spicy? Patrickamer's World Famous Tequila Lime Chicken w/Rice! Orzo, Goat Cheese, Olives, etc.